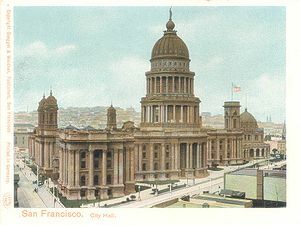 ... 1877 (135 years ago today), amid post-Gold Rush/post-transcontinental-railroad job scarcity, workers in San Francisco called a mass meeting near the City Hall (right). (The building would perish by earthquake 28 years later.) The purpose was to show sympathy with strikers in Pittsburgh. But the meeting turned into a riot -- by workers of European ancestry against Chinese workers, who "constituted approximately nine percent of the total population of" California, "and, since practically all of them were men, at least twice as large a percentage of the total number of laborers." The riot formed part of a long city and state history of hostility, pitting workers of Irish ancestry against their Chinese counterparts. For a gender angle on this story, see "Laundering Gender: Chinese Men and Irish Women in Late Nineteenth-Century San Francisco," written by Georgia Comparative Literature Professor Peter D. O'Neill and published in his co-edited essay collection, The Black and Green Atlantic (2009).